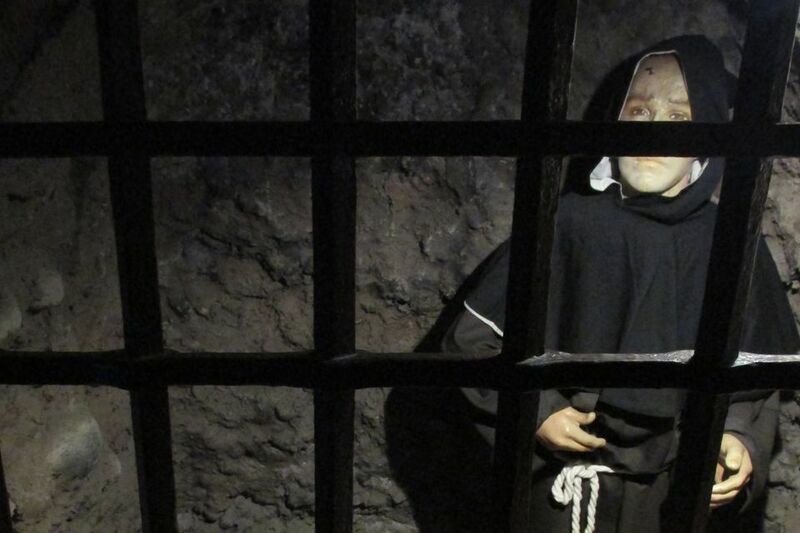 The Museum of the Inquisition in Lima should be a thoroughly depressing place to visit. The bleak history that it attempts to tell, however, is offset by two things. Firstly, it’s free. And secondly—let’s be honest—it’s morbidly entertaining. Those two factors have helped, in part, to make this museum one of the most visited in Peru. The Museo del Congreso y de la Inquisición, to give it its full name, was opened in 1968. The impressive building in which it is housed once served as the seat of the Holy Office and Tribunal of the Peruvian Inquisition, a thoroughly despicable institution established in Lima in 1570. The Peruvian Inquisition, as elsewhere in the world, was set up to ensure that no crimes against the church were committed, and to fight against heresy. Torture and forced confessions were commonplace, and anyone accused of acts such as heresy or witchcraft could easily find themselves imprisoned and awaiting “trial” in the tribunal cells. The second and arguably less intriguing side to the museum—the Congress part—relates to the building’s post-Inquisition role as an occasional meeting place for the Constituent Congress of Peru (formed in 1822, shortly after ​Peru gained its independence) and, up until 1939, as the seat of the National Senate. While nowhere near as eye-catching as hooded Inquisitors and tortured mannequins, the Senate-related aspects of the museum are just as historically significant in their own way. It was here that Peru’s political elite debated over the future of the nation, from matters of warfare to international treaties to issues of capital punishment. The Senate Sessions Room is one of the most impressive in the entire museum, thanks largely to its impressive Rococo-style coffered ceiling, made of more than 30,000 finely-carved wooden parts. The 18th-century ceiling was built by the best craftsmen and carpenters found in Peru at the time. Heading back in time, we return to the most memorable side of Lima’s Museum of Congress and the Inquisition: scenes of imprisonment, torture and religious fanaticism. The museum is divided into a handful of adjacent rooms and chambers, each detailing different aspects of the Peruvian Inquisition—often in graphic fashion. Rooms include the Chamber of Secrets, the Lima Tribunal Room, the Room of Processes, the Room of Secret Cells and the Room of Stocks—all very Big Brother-esque. You can still see the old cells, cramped spaces in which the accused were kept incommunicado: no visits, not even from their closest relatives. They were, however, given rations far superior to those of a normal prison, including meat, fruit and even wine—but considering most of the condemned were probably innocent, it was scant recompense. Then, of course, there’s the torture chamber. Here you’ll see stripped and tormented life-size mannequins being stretched on the rack, whipped in the stocks, hung from the ceiling, and tortured by waterboarding. You'll see hooded torturers carrying out these punishments, extracting confessions while a well-to-do Inquisitor surveys the scene. Another room explains the process of the auto-de-fé, the Inquisition’s ritual in which supposed heretics and apostates were subjected to penance or punishment following an official street procession and public address. In the most extreme cases, the convicted person was burned at the stake; this normally took place in front of the Plaza de Toros de Acho, Lima’s historic bullring. The Inquisition, in Peru as elsewhere, was a particularly violent and unjust institution of the Roman Catholic Church, and Lima was the center of the Inquisition in South America. And while the Museum of Congress and the Inquisition isn’t the best museum in Lima, it does provide a unique and memorable—if bleak—experience. And, of course, it’s free. Even the friendly and informative multi-lingual guides offer one-hour guided tours free of charge (but a tip is always appreciated and, to a degree, expected). The museum isn’t particularly big, so one hour is enough whether you go with a guide or on your own. The written information is in Spanish, so an English-speaking guide makes all the difference if you don’t speak the local lingo. Finally, the Museum of the Inquisition might not sound like good fun for all the family, but Peruvian schoolchildren often go to the museum and generally seem to find the scenes of torture fascinating or freakishly hilarious (or a mix of both). Younger children might find it all a bit terrifying, but older children with an interest in history will probably enjoy a short tour.